If you have not yet heard about Myofascial stretching I’m sure you will soon as it has become the new buzz word in the fitness industry. It is a relatively new concept, to stretch the fascia rather than the actual muscle. According to world re-known Guy Voyer, D.O. who also created the ELDOA method, the actual muscle is just a dumb piece of meat but to truly create some flexibility you must create freedom in the chain not, just the muscle. It is quite different from traditional stretching methods. Myofascial stretches utilizes precise postures and highly coordinated movements to target the fascia surrounding particular muscles and joints. Myofascial stretching doesn’t really have much in common with traditional stretching techniques. It was designed to stretch the muscular chain within fascial chain. The goal is not to gain flexibility but more of a freedom if you will, at the level of the articulation. They are designed to stretch the outer layer of the connective tissue, the fascia, surrounding the muscle and are both specifically coordinated and active. To target a specific area of the fascia you must control the connective tissue of not only the muscle you stretch but also of the tissues that are attached to the bone. 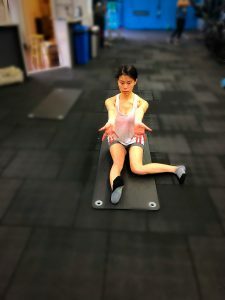 At the same time you must make sure the connective tissue of the rest of the body is not being stretched to try and compensate for the muscle you want to focus on. The goal is that you enhance the quality of the fascia, the performance of the muscle action as well as the recovery after extended use. Water is life. The body is made up of 70% water but how does it absorb into the body? Well, the movement of water throughout the entire body actually relies on proper myofascial balance and function. When the fascia becomes healthier it will hold better hydration. This also has an effect on your metabolism, the more water you absorb the more efficiently you reduce toxins in the muscle tissue and the better everything functions over all.